FirstCar is best known for its print titles, but as a modern and forward-looking company FirstCar enthusiastically embraces any technology or medium if it helps deliver road safety messages with a long-lasting impact. We regularly work with clients creating video, the most vivid example being the virtual reality film produced on behalf of the Leicestershire Fire and Rescue service. This truly immersive 360-degree film puts the viewer inside a car as a car crash unfolds before their eyes. Shown in Leicestershire Fire and Rescue service's 'crash car', young people sit in the car wearing VR goggles. By seating viewers in a car and using VR technology the effect of the film is heightened, making for a truly memorable and thought-provoking experience. The virtual reality experience leaves nothing to the imagination. The crash and its aftermath are shocking, and make a long-lasting impression on young drivers. We're happy to discuss any road safety film project. Whether it's a brief promotional film or a feature-length video to accompany live performances, our specialists can bring your ideas to life. FirstCar offers a complete film-making service, from initial concept to storyboarding, scriptwriting, casting, editing, audio mastering and animation. 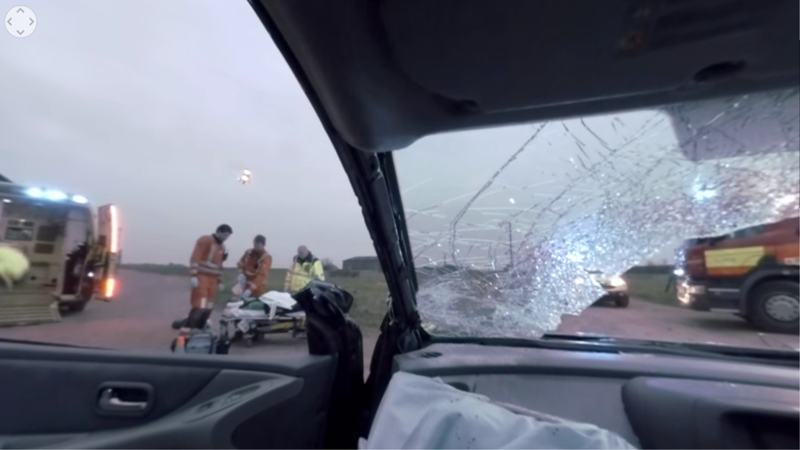 Produced on behalf of Leicestershire Fire and Rescue Service, this was the UK's first virtual reality road safety film. It puts views POV of a passenger during a crash and extraction. This 20 minute film accompanies Hertfordshire's Learn2Live theatre performances. Several strategic stops are included to allow presenters to speak live from the theatre stages. These videos were short pieces to camera using a studio background, two presenters and kinetic typography. The brief was to get many key messages across in a small amount of time. The cost of producing a film can vary enormously, but it's often cheaper than people think. As a rough guide, you should allow £1,000 per minute of high quality film that involves hiring locations, actors or presenters, and post-production work such as kinetic typography. However, there may be economies of scale when producing longer videos. As with everything, a cost/benefit analysis should be done prior to commissioning work. But compared to other forms of media, film offers very good value for money. We have worked on projects where video has been used to secure additional support and funding, more than covering the cost of the film itself.